VANCOUVER, BC– October 9, 2013: Ostara Nutrient Recovery Technologies Inc., a leader in the commercialization of proprietary nutrient recovery technology that recovers nutrients from used water streams, announced today it has been named in the prestigious 2013 Global Cleantech 100, produced by Cleantech Group, a global market intelligence and consulting firm helping executives connect with innovation. Ostara’s technology recovers phosphorus and nitrogen from municipal and industrial wastewater streams and transforms them into an environmentally responsible, enhanced efficiency fertilizer called Crystal Green®, which is used by growers in the agriculture, turf and ornamental sectors throughout North America and in Europe. The Global Cleantech 100 list is derived from Cleantech Group’s own data and research, combined with the weighted qualitative judgments of hundreds of nominations, and the viewpoints of a global 90-person Expert Panel. To qualify for the list, companies must be independent, for-profit, cleantech companies that are not listed on any major stock exchange. Ostara designs, builds and markets a proprietary nutrient recovery technology that transforms phosphorus and nitrogen recovered from municipal and industrial wastewater into a high-value, eco-friendly fertilizer, sold and marketed as Crystal Green®. Ostara currently operates five nutrient recovery facilities in North America and will launch two additional plants later in 2013, including its first European site in Slough, UK for Thames Water. Crystal Green is the first plant-activated, nutrient technology to offer plant-available, slow-release nutrients sustainably made from a renewable source of phosphorus. Crystal Green offers more consistent, plant-available nutrients than conventional water-soluble phosphorus fertilizers, resulting in greater fertilizer efficiency, lower application rates, and reduced nutrient loss, while lowering the risk of leaching and runoff, thereby protecting sensitive regional waterways. 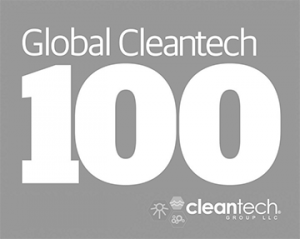 Ostara is the recipient of numerous awards including the 2011 Technology Pioneer by the World Economic Forum, and being named to the Global Cleantech 100 for the past four years and is headquartered in Vancouver, Canada. For more information, visit www.ostara.com and www.crystalgreen.com.